One reason why WordPress is a good choice for small businesses is, thanks to plugins, you can add features and functionalities to your website without needing to know how to code. In previous posts, we’ve talked about the importance of choosing the right domain name and how to host your WordPress site. We’ve also provided a broad resource describing why WordPress makes sense for small biz and now we’ll explore the use of plugins. Plugins are software programs you can select and install on your WordPress site, often for free. Others are available in pricing tiers: a free option and a more expansive premium version. Who can install them on your site? Anyone with admin access. They are simple enough that you can usually install them yourself, or you can provide temporary admin access to trusted vendors to help you install them. Select the ones you want to install from the WordPress plugin library—you will periodically need to update them, as well. When potential customers search online for the products and/services your small business offers, you’ll want your site to show up. To help make that happen, it’s important to optimize your website, including the title tags and meta description tags associated with each page and post. 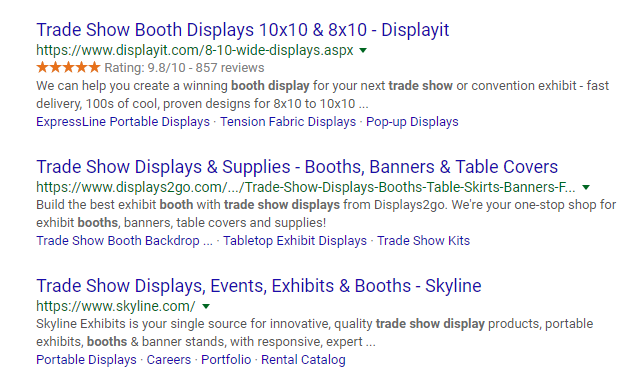 Looking at the first listing, we see “Trade Show Booth Displays 10×10 & 8×10 – Displayit.” That is the title tag text. Title tags still serve as a key ranking factor in Google. After the URL, we then see this text: “We can help you create a winning booth display for your next trade show or convention exhibit – fast delivery, 100s of cool, proven designs for 8×10 to 10×10 …” This is the meta description text. 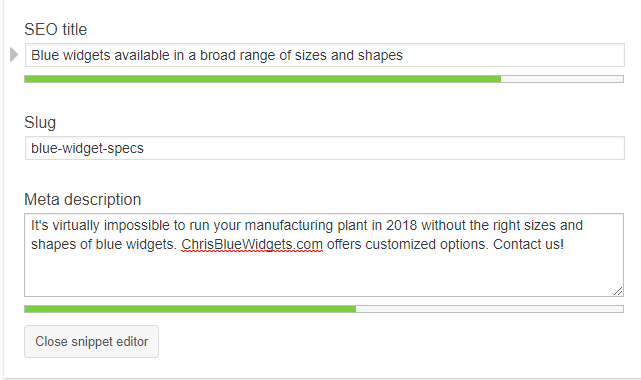 Although this text does not serve as a ranking signal, it’s crucial to include compelling text in this tag to encourage people to click on the listing. The sample one we’re looking at seems to be a good description; if it wasn’t, the searcher is likely to go on to the next listing in hopes of finding a solution to his or her problem. Sites that rank well in Google typically have quality inbound links coming in to their sites. How to define them and how to get them is too broad of a subject for this post. Here, we want to talk about an unfortunate side effect—to get links, less savvy marketers and those who want a quick fix will create and post blog comment spam. These are comments that are usually vague, often irrelevant to the subject in the blog post, and distributed far and wide in the hopes that the link provided at the end of the comment will help the site listed in that comment. So, if you sell blue widgets and see something like this in the comment section of your blog: “I am very grateful that you are willing to read my book and I like what you said in your post about it. [www.likemybook.com],” be aware this is a spam comment. You sell blue widgets and aren’t in the business of blogging about someone’s book. However, since it’s cheap and easy to spam blog posts, you will likely get a number of these comments on your blog posts. And, since you don’t want these comments to appear on your blog, as that will make YOUR site look less than professional, you’ll want to filter out these comments. Although no perfect solution exists, and while you’ll still need to keep an eye out for spam comments, Akismet does a wonderful job of reducing the scope of this issue at a low cost. You want your prospects and customers to contact you, and contact forms go a long way in making that easier for people to do. You could simply list your email address on your site, but that could quickly fill up with spam email. In addition, a contact form just makes your site look more professional. A free plugin for adding forms, and one that’s easy to use, is Contact Form 7. If you find that you need more options for designing your forms and integrating them to your site, you can purchase a license and then use Gravity Forms. The post WordPress Basics for Small Businesses: Choosing the Best WordPress Plugins appeared first on AllBusiness.com. Click for more information about Chris Gregory.